Mike Bartlett’s hit play turns out to be something of a modern masterpiece. It’s a Shakespearean history play set in a not-too-distant future and begins with some funereal choral singing by the candlelit cast, a requiem for the late Queen Elizabeth II (a beautifully atmospheric composition by Jocelyn Pook). There is an additional frisson seeing the play on the eve of Her Maj’s breaking of the record for the longest reign in British history. The Queen is dead, boys, and Charles succeeds. The action covers the period between succession and coronation and it soon emerges that Charles will not settle for being a figurehead, rubberstamping legislation willy-nilly. His refusal to sign off a law restricting the freedom of the press triggers a constitutional crisis, the dissolution of Parliament and riots in the streets. 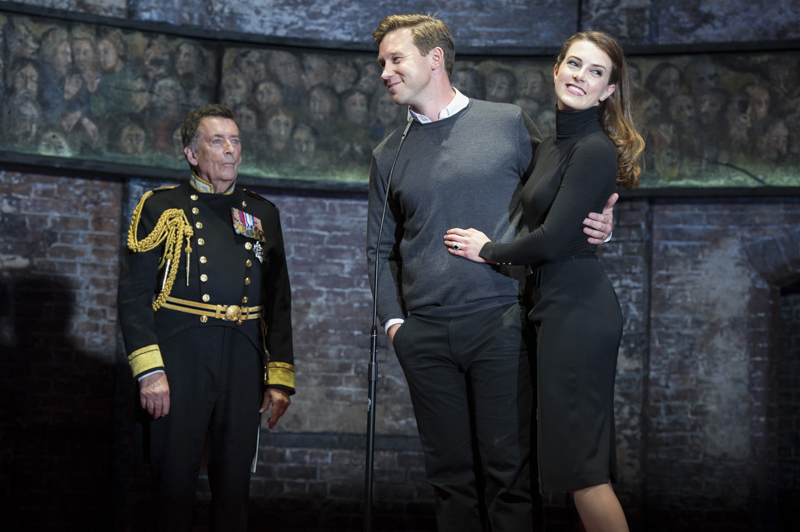 Prince William, egged on by a Lady Macbeth-like Kate, puts himself forward in a bloodless coup, seeking to take the crown for himself ahead of time. In fact, blood is the only thing missing from this history. Bartlett gives us a lot of fun with blank verse (where mentions of Sainsburys and Wetherspoons add bathos and seem anachronistic); rhyming couplets end scenes and there is even a ghostly Diana stalking across the stage, intoning cryptic prophecy. It’s a very funny piece, peppered with satirical barbs (the script is updated constantly to keep it topical) but in the end it is a tragedy on the grand scale, where the main character’s fatal flaw is his conscience. As the new king, Robert Powell is magnificent, stately and regal and also human. The iambic pentameter of the verse drips off him – It is important to note the cast do not do impressions of their real-life counterparts. They are personages in a drama, a game of thrones, rather than caricatures – although there are plenty of references to make them recognisable to the people we know and lampoon today. Penelope Beaumont brings dignity to the role of Camilla, here a kind of advisor and voice of reason, while Jennifer Bryden is deliciously Machiavellian as the scheming Kate, urging husband William (Ben Righton managing to look dashing in a comfy pullover) to man up and step up. Charles is pretty damning of the Wills-and-Kate effect, their empty, plastic, tabloid popularity. Monarchy without meaning is very much the thrust of the drama. Richard Glaves is fun as hedonistic Harry, slumming it in nightclubs and late-night supermarkets, until the pull of duty and the status quo yanks him back into line. The play questions the role of monarchy in a supposedly democratic, egalitarian society. Evans, the somewhat Cromwellian Labour PM, speaks passionately and reasonably (a forceful Tim Treloar) while Stevens, leader of the Tory opposition (an excellent Giles Taylor), behaves exactly as we expect politicians to carry on. Evans seems almost too principled and too good to be true in comparison! There is strong support from Lucy Phelps as Jess, Harry’s proletarian girlfriend, and Dominic Jephcott as James Reiss, both on contrasting ends of the social scale. Directors Rupert Goold and Whitney Mosery give the piece the gravitas necessary for us to take the play seriously. What could have been just an amusing skit and an intriguing conceit becomes a thought-provoking and relevant night at the theatre, powerful, entertaining, enlightening, and ultimately moving.